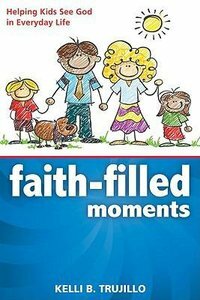 Faith-Filled Moments offers parents creative ideas for transforming kids' everyday experiences into avenues of life-changing connection with God. Unlike scheduled family devotion times, these transforming encounters can be woven into any moment of the day. Plus, the multi-sensory ideas in Faith-Filled Moments include a wide variety of approaches, like games, crafts, cooking, object lessons, drawing, and encounters with nature, as well as everyday activities like riding in the car, walking, getting dressed, reading, listening to music, or bathing. ^ With activities aimed at reaching a child's heart, soul, mind, and strength (Deut. 6:4-9; Mark 12:30), this book will help you to impress God's Word upon your children's hearts as you interact with them in daily life. - Publisher Faith-Filled Moments will give moms creative ideas for transforming kids' everyday experiences into avenues of meaningful and life-changing connection with God. In Deuteronomy 6:4-9, God commands the Israelites to use a variety of means to impress upon their children the importance of fully loving God. Faith-Filled Moments uses this passage's framework of heart, soul, mind, and strength (reiterated by Jesus in Mark 12:30) to provide unique ideas for helping kids grow in faith as fully devoted followers of Jesus. Unlike scheduled family devotion times, these ideas can be woven into any moment of the day. Plus, the multi-sensory ideas in Faith-Filled Moments include a wide variety of approaches, like games, crafts, cooking, object lessons, drawing, and encounters with nature, as well as everyday activities like riding in the car, walking, getting dressed, reading, listening to music, or bathing. Faith-Filled Moments will give moms creative ideas for transforming kids' everyday experiences into avenues of meaningful and life-changing connection with God. In Deuteronomy 6:4-9, God commands the Israelites to use a variety of means to impress upon their children the importance of fully loving God. Faith-Filled Moments uses this passage's framework of heart, soul, mind, and strength (reiterated by Jesus in Mark 12:30) to provide unique ideas for helping kids grow in faith as fully devoted followers of Jesus. Unlike scheduled family devotion times, these ideas can be woven into any moment of the day. Plus, the multi-sensory ideas in Faith-Filled Moments include a wide variety of approaches, like games, crafts, cooking, object lessons, drawing, and encounters with nature, as well as everyday activities like riding in the car, walking, getting dressed, reading, listening to music, or bathing.